Its been a while since I did a new edition to Kickstarter Watch. Actually, its been so long since I did one of these, is that what I called it? I digress as that is what we are calling it now. There have been a couple games to pop up on Kickstarter the last few months that we went crazy for here at Late Night Players. Academy Games launched Agents of Mayhem: Pride of Babylon, followed by Monolith Board Games launched the impressive Batman: Gotham City Chronicles. For the record, while I did not comment on the message feed for it or approve of any of their bullying, I am Team Batcow all the way. But we aren’t here to talk about those games. No, of course. It is spring time which means its time for another CMoN Kickstarter. This time, we’re talking an interstellar journey in a futuristic update to their classic Zombicide franchise- Zombicide: Invader. 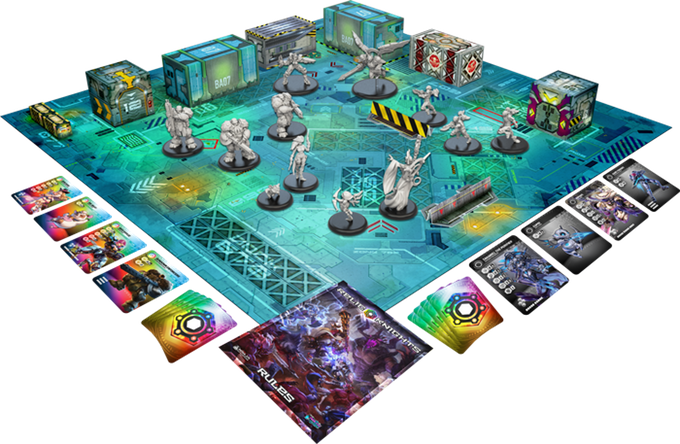 “Zombicide: Invader is a standalone cooperative board game for 1 to 6 players, taking the trademark Zombicide action into the far reaches of space! Players control a group of Survivors trying to defend their remote mining outpost from a swarm of infected aliens controlled by the game itself. The more experience and power the Survivors earn, the more Xenos invade the facility! I wish my painting skills were half as good as this! Taking a cue from Black Plaque, the new plastic dashboards are beautifully laid out. At the time of this write up, the game is already funded multiple times over. Originally seeking $250,000 for production, the game is sitting at $1,182,662. This means they’ve unlocked a plethora of stretch goals, as well. With 24 stretch goals unlocked, they are sitting on a 25th goal of $1,240,00. The 25th stretch goal and a face only a mother could love. Currently, there are only two pledge levels: Civilian and Soldier. The Civilian pledge is $100, and includes the core game, exclusive miniature and all applicable stretch goals. The Soldier pledge is $150, and it includes the core game, Black Ops expansion, two exclusive miniatures and all applicable stretch goals. The Black Ops expansion includes 6 new survivors, a new abomination and 3 new tiles. It also includes 6 additional dashboards for 12 player games. So here is where I am going to have to be a little negative, and I really, truly do not want to be. The game, for all intents and purposes, looks like it should be a fun and exciting addition to the Zombicide family. However, as has become the tradition with all CMoN products, its honestly about what the add after the fact that make these campaigns exciting and worth participating in. Zombicide Black Plaque: The Greene Horde had some of the most amazing miniature stretch goals and add-ons one could possibly ask for. Each miniature was a work of art, amazing homage and made unlocking it a celebration. I don’t get that feeling with this campaign. At least so far. Every other survivor is a parody/homage, while the in-betweens are original characters. The art style, while beautiful and inspiring, does not translate well to showing off the parody in figure form. The original survivors, minus possibly one or two, are boring and lack any real character. This does not go for the aliens, however. The creatures are beautiful and if I could swap out the original design survivors for more of the creatures, I probably would if I weren’t such a completist. To top it off, especially after such a quick and amazing first 30 minutes the campaign was live, things are slowing down. I don’t know if it is just Zombicide fatigue, easy considering that Greene Horde hasn’t even completely shipped yet, or if others are finding aspects of the game as uninspiring as me, but the pace is a crawl at this point. I am left wondering if it wouldn’t have served them better to have called the game something else and treated it as a totally new and original IP as opposed to a sequel in a long running series. Plus, Xenocide would have made for a killer title! In the end though, regardless of how much I am concerned or left underwhelmed, they have me for a Soldier pledge. I learnt a long time ago that if I want a CMoN game, get it via Kickstarter or else my collector’s OCD will kick in. I’m looking at you, Arcadia Quest. Hopefully we’ll see some sort of cool and amazing add-ons to get the stretch goals running again. The other day, I realized that I have a lot of hats tossed in on KickStarter right now. I just finalized my Mythic Battles: Pantheon pledge and it got me to thinking that a great feature might be to spot light some KickStarters that I and my gaming group think others might enjoy. I figured this week I’d started with a few that I’m personally backing. 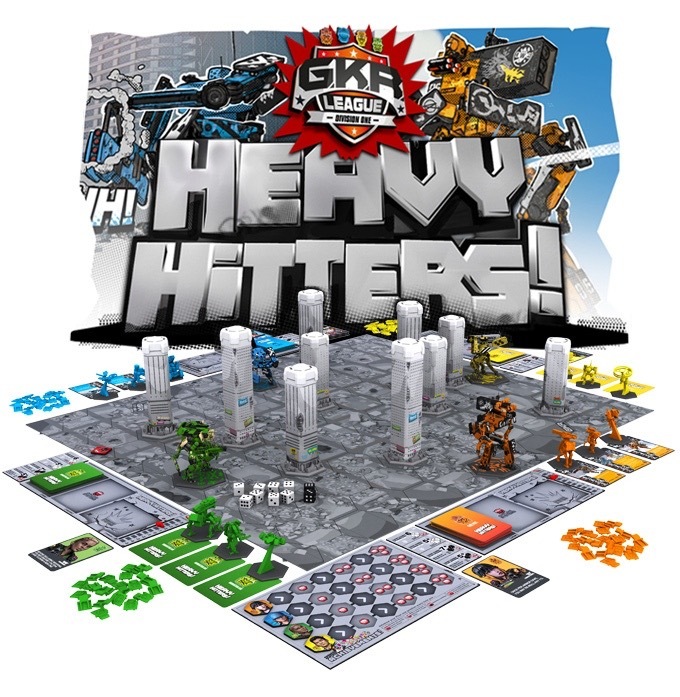 First up, this one should come as no surprise: GKR: Heavy Hitters! Anyone that has been following my blog knows that this was my “Game of GenCon 2016”. I did a pretty big write up of the game at the time, explaining the rules and such. If you haven’t read it, just click here. At the time of this writing, they have raised $625,271 on a goal of $100,000 with 15 days to go, so obviously they are funded. They have also currently unlocked 21 of 22 listed stretch goals, of which 10 of the 21 are listed as KickStarter Exclusives. Pilot’s Edition- $125, includeds plastic miniatures of the pilots. Painter’s Edition- $150, includes the Pilot’s Edition with 4 dismantled and unpainted mechs for customization. Urban Wasteland Expansion- $45, includes 12 turrets for the top of the buildings along with 10 plastic buildings and other cosmetic additions. Something to note is that shipping on this game is astronomical by comparison to other titles. The base game alone to the United States is estimated at upwards of $45. 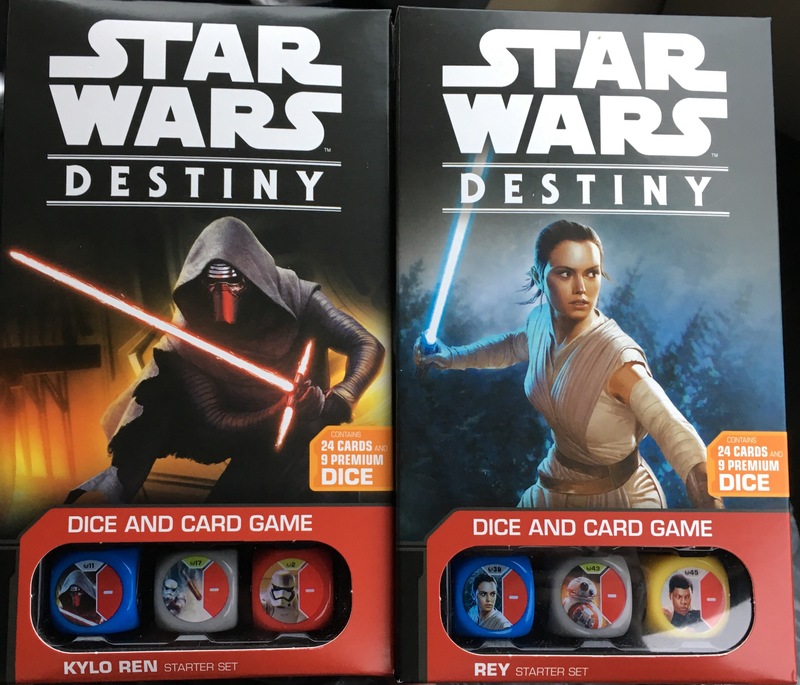 So the shipping is almost $50 of the base game. I was hyped for this game and was one of the first backers, and I am still hyped, but I have to be realistic. Initially I had predicted this game to hit $1-$1.5 Million based on the company behind it, the great experience I had demoing it and the amazing PR they have had these last 7 or so months. However, with the shipping, lack of add ons and questionable lengths between stretch goals, this game hit a brick wall early on. I’m now predicting $750,000 max if it gets a strong last week push. Still, highly recommend getting in on this through KickStarter if only for the plastic dashboards that are exclusive. I’m in for a Painter’s Edition and Urban Wasteland Expansion myself. Next up, Relic Knights: 2nd Edition. Relic Knights: 2nd Edition by Soda Pop Miniatures. 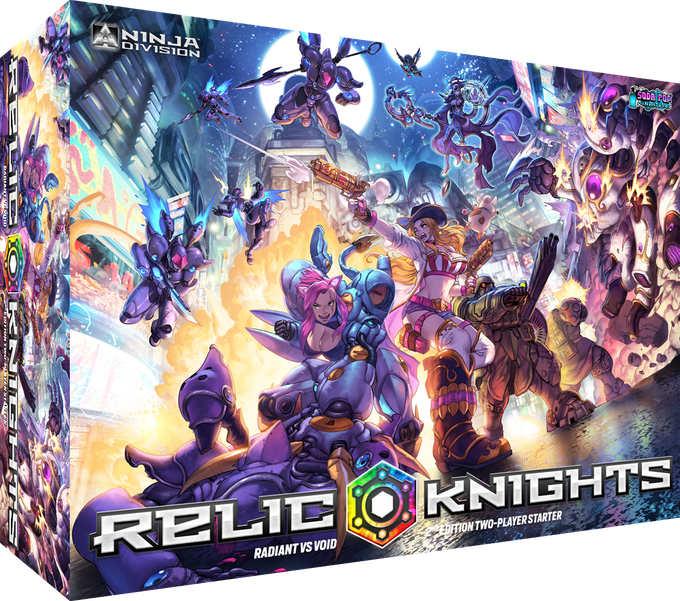 Relic Knights is a game I’ve looked into several times the last couple trips to GenCon, but one I never fully felt ready to take the plunge with. 2nd Edition is poised to change that. Relic Knigjts is a 2 player a sci-fi miniatures game with a heavily anime influenced theme. As of this writing, they are funded with $219,653 on a goal of $50,000 with 4 days left. They’ve unlocked 33 of 38 listed stretch goals, with 6 of the 33 listed as KickStarter Exclusive. Note however that their stretch goals are a bit odd. Some are unlocked add ons at a steeply discounted price or upgrades to existing models. I highly recommend researching the stretch goals heavily so there isn’t any disappointments if you get your package and something isn’t there. Hero- $70, includes 2-player starter with 2 exclusive models (no stretch goals). Questing Knight- $130, includes Hero pledge, 4 exclusive models, 2nd Edition rulebook and 2nd Edition Upgrade Deck. Relic Knight- $150, includes Questing Knight pledge and Void Break Expansion rulebook. As for as add ons, there are too many to list. The whole idea behind Relic Knights: 2nd Edition is to rework the game from the ground up, including all existing models. Some will be left alone, some retired, some reworked. The add ons for this KickStarter are all existing models at deeply discounted prices. Again, something to research. Like all CMoN KickStarters, this one blew up and was funded in a matter of minutes. It’s not hard to see why. A spiritual successor to Blood Rage, this is a game of political alliances, mythical creatures, ronin and the seasons based in feudal Japan. It’s a gorgeous theme in a gorgeous package. With 25 days to go, it is at $1,772,645 on a $300,000 goal. They’ve unlocked 25 out of 26 listed stretch goals, with 15 of the 25 being listed as KickStarter Exclusive. Several stretch goals are component upgrades and new monsters, but there is a rather big exclusive- a 6th clan! Currently the game supports up to 5 players, but this will allow a 6th player. Game wise, they only have one edition for $100. That will more than likely be the retail cost, but it’ll include an exclusive model and all kinds of stretch goals.﻿ There are also 0 add ons so far, but they still have nearly a month to go. This one will easy break $3-$3.5 Million easily. If it doesn’t, I’ll be extremely disappointed. So those are the three big ones I’m following and investing in. Obviously, these are three very different games and they may not be for everybody. These are just my recommendations. Another week has gone by meaning time for an update on all things in that happened for us at Late Night Players. This brings are total to: 18/500 games played, 4/50 new titles explored. Not bad for the first two weeks of the year. First, the cards I ordered for my joke deck featuring Mike the Shipwright have started coming in. 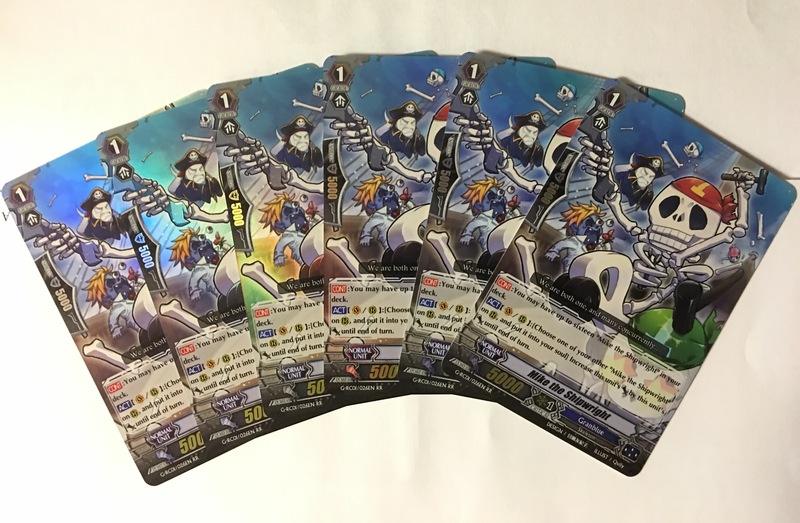 I was extremely excited to begin building and testing this deck, then I saw last night’s World Championship finals- Granblue vs Granblue. It was so boring to watch. And rather the champion cheated or not, he should have definitely been called out for the way that he was shuffling his deck (cards face up). Both two of those things are a strike against me wanting to continue the construction of this deck. However, I have to remind myself that I am building neither a G1 or G2 Rush deck, so it hopefully won’t play out that boringly. I have 4 more in the mail, just have to order the final 6. 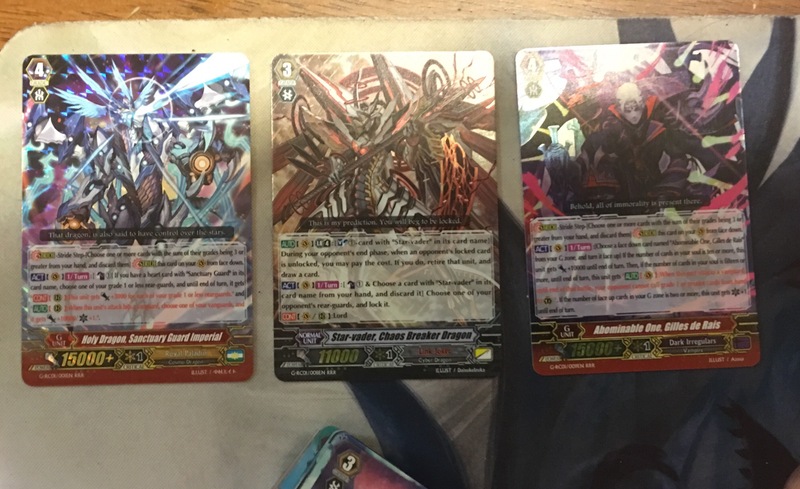 I got in 3 games of Vanguard in as well. Sadly, I went 1-2. My brother’s Gear Chronicle deck is just too solid versus either of my Link Joker or Shadow Paladin builds right now. Love the box art on these games! This was definitely a pleasant surprise to say the least. We talked a little bit about it here. Now to sleeve up all those beautiful cards and start playing. The game is officially the new “hotness” in the tabletop gaming world. Product is so scarce that $2.99 boosters can fetch $15. Anyways, demoed the game on Wednesday after being told how fantastic it is. Truth be told, it is rather enjoyable. Luckily the a couple days later a local shop got in a couple of starters while another a box of boosters. These plus 6 boosters have us up to a good start. Unfortunately the weather was not holding up well enough to primer this week, nor did I get an opportunity to assemble any of the others we have. I think I need to take some time off my normal job just to assemble the rest. Well, that was our week. Happy gaming! 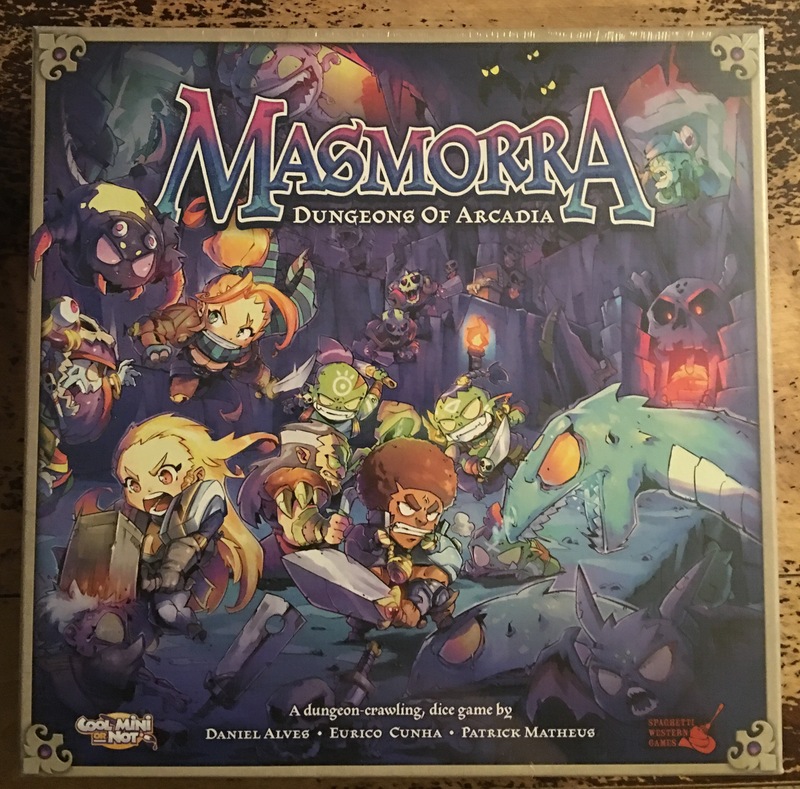 Spinning out of the popular Arcadia Quest series, Masmorra is a hidden tile dungeon crawler. It is for 1-5 players, using an interesting dice and card based mechanic. 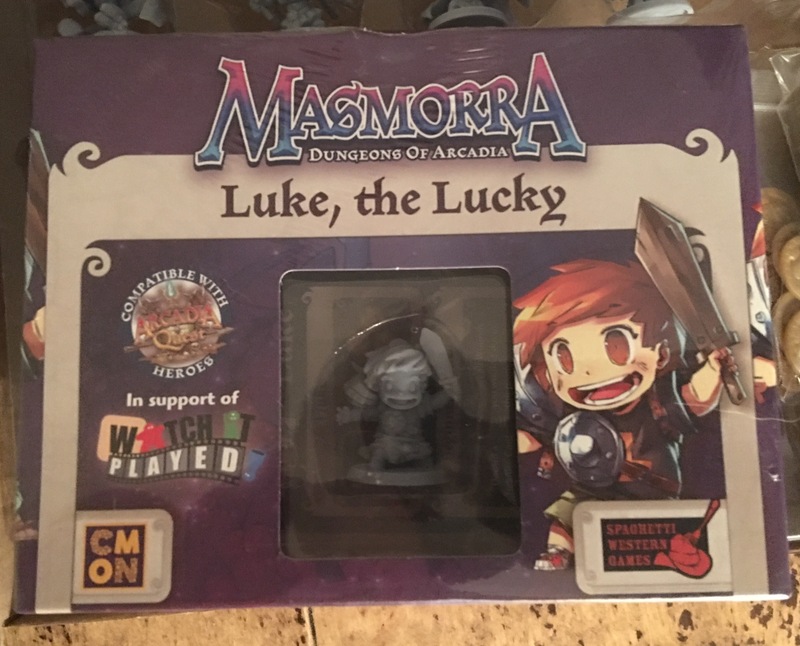 The KickStarter managed to unlock an additional 14 miniatures that were all KickStarter exclusives, as well as a limited edition Luke the Lucky miniature, bringing the total to 20 miniatures. 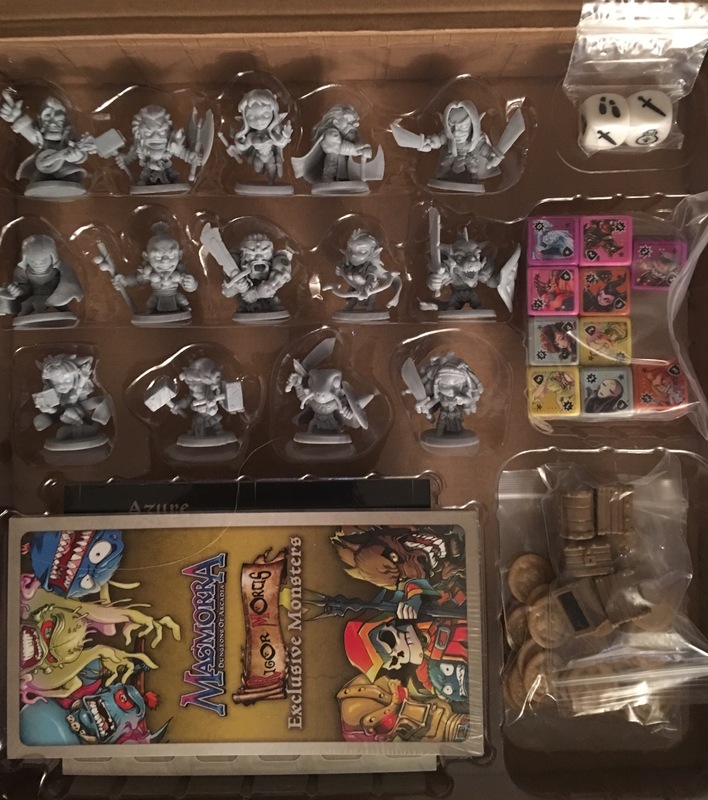 There was a conversion kit available to make all base set miniatures from Arcadia Quest and Arcadia Quest Inferno work with Masmorra. That triples the number of playable miniatures available. I cannot wait to figure this game out and share it with our group. Maybe a review?